This recipe calls for spring asparagus, sun-dried tomatoes and fresh basil. When you only need a small amount of fresh herbs like basil, try buying fresh herbs in the tube at grocery store. They last for 3 months in the refrigerator and are sure to come in handy. Preheat the oven to 350 degrees F. Coat the ramekins or 6 cups in a muffin tin with cooking spray. Set aside. Add olive oil and cooking spray to a medium non-stick sauté pan over medium heat and sauté the asparagus and sun dried tomatoes for 8-10 minutes or until asparagus begins to soften. If asparagus is really thick, add a couple of Tbsps. of water to the pan and cover for 5 minutes to steam, then continue sautéing until all liquid is absorbed. Set aside to cool. Whisk together basil, egg substitute, skim milk, flour, salt and pepper until smooth with no lumps. 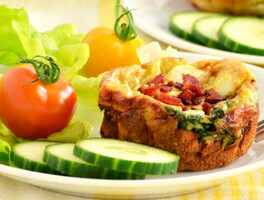 Divide the asparagus mixture evenly among the six ramekins or muffin tins. Cups will be full. Carefully pour the egg mixture over the asparagus just to the top, do not overfill. Bake for 30 minutes or until the custards are puffed and just starting to brown. Remove from the oven and cool slightly. Then turn the custards out of the ramekins or muffin tins and serve.